For drilling in wood, metal and plastic. Each high speed steel bit is hardened and tempered for long life and high performance in tough applications. 10250 10 pc. 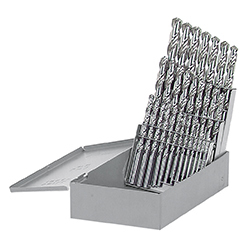 set in plastic case includes bit sizes 1/16" through 5/32" in 1/32" increments plus bit sizes 3/16", 7/32" and 1/4"